This treatment method is designed for those of you who would like to improve their skin texture, fight fine lines and wrinkles, and reduce the visibility of age spots and other skin imperfections. The device comes with 12 puff refills and 24 free puff refills (total of 36 puff refills) and the procedure is quite similar to the one aestheticians perform in professional beauty salons but with Neutrogena Microdermabrasion System you can do the treatment yourself. According to the product presentation, the results of such treatment are immediate and you can see visible improvement in your skin condition right after performing the procedures needed. 1 What are the pros and cons of Neutrogena Microdermabrasion? 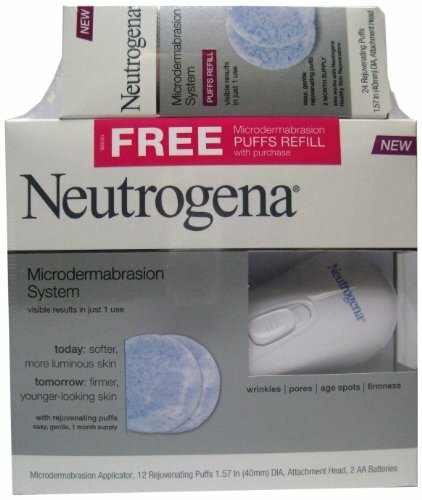 4 Does Neutrogena Microdermabrasion System really work? 6 How much does Neutrogena Microdermabrasion System cost? What are the pros and cons of Neutrogena Microdermabrasion? This device is designed to boost circulation and oxygen flow while increasing cell turn-over. The system uses pads with a Velcro back. Not brushes. But anything that has a Velcro back will stick. The Neutrogena Microdermabrasion system works by vibrating (with the pad moistened), and you own hand movement around your face, neck or shoulders. The gentle vibrations help exfoliate and cleanse your face. This affordable at-home system uses disposable puffs (designed with ultra-fine crystals and mild purifiers for gentle and pleasant exfoliation) and the microdermabrasion applicator. This device provides firmer, younger-looking skin if used regularly (according to the manufacturer). Visible results can be observed even after the first time you use it – this is confirmed by multiple customers who shared their experience. However, we couldn’t find an actual clinical evaluation proving these effects, so we cannot consider this information reliable. You will be the one to judge. You should also consider the fact that this device is battery-powered. 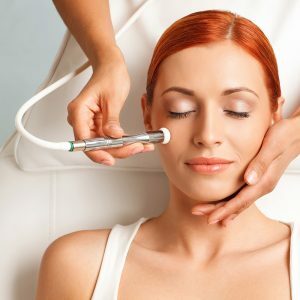 When it comes to microdermabrasion, the power source factor is significant, as batteries offer a unique portability potential (and, yes, you won’t need to seek out an electrical outlet) but, unfortunately, do not have the capacity of electrically powered microdermabrasion machines. This is why there is no suction/vacuum feature in this Neutrogena Microdermabrasion System – batteries cannot provide sufficient power for it. Does Neutrogena Microdermabrasion System really work? The product performance is not very impressive, this is why we highly recommend checking every aspect of this product before buying it. Not only do I not see improvement with sun spots for myself, I don’t believe Neutrogena’s claims. They use the phrase “clinically proven” but I failed to find any links to publications from Neutrogena’s product website. I think this is more a cleaning system than a micro derma system. It makes your face feel clean but doesn’t get deep enough to make a significant difference in the surface texture or spots. I used it a few times and I had red blotches all around my face and neck after using this device. My favorite affordable form of microdermabrasion! Bought one to give away because I love the way it leaves my skin. I use it twice a week on varied areas and I love the results I get and without the irritation. I just turned 50 and my skin looks great! I was not too sure about microdermabrasion but this little thing changed my mind. It did not hurt my face but gave it a good stimulating scrub. My face is so much smoother after one use and now after a month, it’s brighter and feels so much more radiant. I definitely recommend this product. After the first use, I noticed quite a difference in the appearance and feel of my skin. My skin felt so much softer and cleaner! Like another reviewer noted, it was like 40 lbs of make-up had been taken off, haha. Also, I noticed that the pores on and around my nose were visibly smaller (yay!). How much does Neutrogena Microdermabrasion System cost? Compared to similar microdermabrasion system, this one is quite affordable and it has bonus free puff refills. You can purchase it from your local store or an Online retailer and the price will vary (as expected) depending on where you buy it, but it shouldn’t exceed $40. Yout skin is unique.It has its'own needs and characteristics and may get irritated if you don't treat it properly. In order to avoid potential skin reactions, such as burning sensation, rash, allergy or increased skin sensitivity, use your beauty device carefully, according to the instructions indicated!